TRIVIA of Noh : Q145 : What is “kaburimono”? | Home | Trivia | Q145 : What is “kaburimono”? Some non-human characters, including gods and heavenly maidens, appear in Noh plays. While you may distinguish humans and such characters with their masks, you may also get a clue by looking at the pieces with a different design on their heads. For example, the heavenly maiden in "Hagoromo" appears with a mask similar to one for a female human and a gorgeous crown on her head. 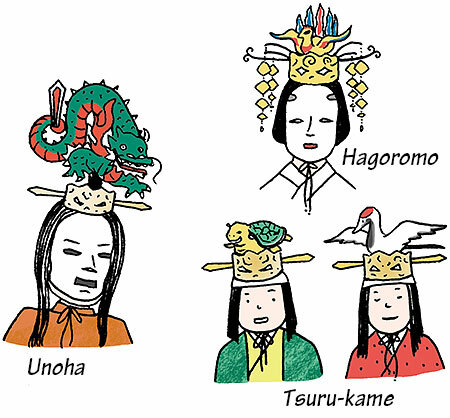 Apart from kahatsu (hairpieces, or wigs), props on the head, including caps and crowns, are collectively called "kaburimono" (headgear). Among them, crowns for those in high places, such as court nobles, emperors, gods, and spirits, are gorgeously decorated. Types of the design are diverse: dragons, tigers, foxes, herons, and butterflies. Those creatures depict the roles of the actors who wear the crowns. In "Tsuru-kame", for example, two juvenile actors (or two tsure actors) wearing pieces of headgear with the ornaments of a crane and a tortoise appear and dance a dance of celebration for the emperor (the leading part). An ornament of a dragon depicts the actor as the dragon god (in "Kasuga-ryujin", "Tamai", etc. ), and an ornament of a fox makes them as the spirit of a fox (in "Kokaji", etc.). "Unoha" is a unique play in which the headgear stands out. The play was recently revived by the Kanze school. You see a lot of characters with headgear in the play, even including the spirit of the fish. We are apt to look at masks when we watch Noh plays. But if you give your attention to the props on the head, it will help you understand the of the characters and further enjoy the plays.